The charity's Sarah Duffen Centre, in Portsmouth, teamed up with Southern Focus Trust's Supported Employment Service to provide the work opportunities. The five employees, who all have Down syndrome, started working at the centre earlier this year as production and administration assistants following successful job trials. Each employee works for a total of four-and-a-half hours every week on a range of tasks. Initial job coach support from Southern Focus Trust, to help the five settle in and learn their tasks, has now faded to on-the-job support from other staff at the centre. Three of the employees work together on Mondays. The two other workers are employed on Wednesdays. Centre Trustees pay for taxis to and from work for all five under an arrangement set up by the Supported Employment Service. All five employees, four in their early 20s and one in his 40s, are carrying out Supported Permitted Work under regulations laid down by the Department for Work and Pensions. Their weekly wage does not affect their welfare benefits because it is within a disregarded limit set by the Benefits Agency for people receiving means-tested Income Support. One of the workers, Ellie Hardy, aged 21, said: "I love my job. It's absolutely brilliant and means a lot to me. I like doing different things at work and talking to the other people." Southern Focus Trust's Supported Employment Service was set up in 1997 to help people with learning disabilities find work. Since then, the service, which has financial support from the European Social Fund and Hampshire County Council, has helped people find employment, both paid and voluntary, and training opportunities. 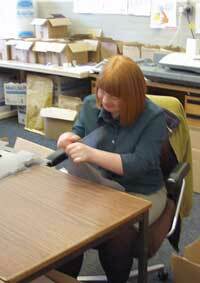 The service also runs three businesses employing people with learning disabilities. In summer 2000 the service set up a shop in Leigh Park, Hampshire, selling donated pre-owned clothing and toys. The shop currently employs 16 part-time retail assistants who work with job coach support. Further jobs have been created in the two other business ventures, a gardening service and a catering operation providing lunches for staff and service users at a Day Service for people with learning disabilities. 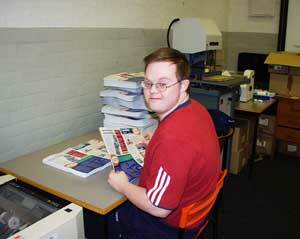 When the charity took the decision to set up its own publishing and printing facilities, we realised that we would be able to offer employment to adults with Down syndrome. We were planning to install digital printing equipment and the finishing equipment necessary to produce our own publications, such as this periodical. With employees with intellectual disabilities in mind, we chose equipment that was as safe and as easy as possible to operate. Easy does not necessarily mean simple to operate, but it does mean that machinery can be to set to run in a relatively trouble-free manner by staff. The finishing equipment includes a cutter for cutting covers to size, a booklet maker to fold and staple books (see the photos on this page) and a driller, to drill holes in books intended for ring binders. Books being sold as packages have to be put into binders. In addition our mail order service requires stuffing of envelopes, sticking on address labels and franking mail through an automated in-house franking machine. It also requires the assembly of plastic boxes and then putting in the right contents for each of four teaching packs. In other words, we have a range of tasks which our employees enjoy and do with considerable competence. We were careful to plan the start of the employment project at a time when we felt we were sufficiently organised and experienced with the production work, and when we had enough work and enough staff in place to ensure that we could offer a quality work opportunity. We started production in December 2000, but we did not start the employment project until September 2001. We then asked Southern Focus Trust to guide us and to set up work training for the first 3 workers. They visited to discuss what we could offer and they then offered work trials to adults whom they were in contact with. They also provided advice for us and a job coach to work with our staff to train the workers. The first 3 employees settled in and learned the work tasks much quicker than we anticipated. They all enjoyed the work and wished to become employees. As the first 3 moved onto the pay roll, we then took another group of 3 on a work trial. We have 6 adults working for us but only 5 on the payroll as the 6th person has paid work elsewhere, so chooses to come to us as a volunteer. (The UK Disability Benefit system prevents her from being paid in two jobs - she would exceed her earnings limit). The second team of three settled in as quickly as the first group, though one individual has rather more significant intellectual disabilities than the rest and it has taken him longer to learn all the tasks. He also has additional personal care needs and we asked for support for him for longer than the rest of the group, but he is now working without the additional support. When we first met the prospective employees, they seemed to have quite varying skills - that is, some had better spoken language than others, and some had better motor skills than others - and we predicted, wrongly, that their competence on the job would vary. All the employees have become very competent and capable of a much higher level of productivity than we anticipated. Ability as an employee is certainly not linked to speech and language skills - which vary significantly from one adult with only a few words to one who is a very competent talker. The adult with additional physical needs, a mild hemiplegia, has been determined to master all the tasks - even stuffing envelopes. The employees vary in age from early twenties to late forties and they can work unsupervised on almost all the tasks. However, we do have another member of staff supervising their work schedule for the day - keeping an eye out for them even though she does not need to be with them all the time. They know what to do if a machine breaks down or jams - or if they run out of work. Their time-keeping is excellent and we have had very little time lost to sickness. All the employees have fitted into the work team and to the social life of the work at the charity. We have been clear that socialising with staff is done at coffee breaks and lunch breaks. We have worked as a group to encourage appropriate work behaviour, for example, pointing out that interrupting staff for a chat is not appropriate and ensuring clear guidelines are followed by all staff. We have had far fewer issues than we anticipated in settling our new employees into their work. They are a pleasure to have in the work team and we all look forward to the days when they work. If the publishing output continues to increase, we will take on another team of three. They work in two teams, at present each coming for one day a week and this seems to work well. Work with an employment agency if you can - they will advise on suitable work tasks for individuals, provide job coaches, deal with Benefit issues and advise on Health and Safety issues. Plan ahead to ensure your organisation is clear about the work it can offer - we did not want to be trying to find tasks each week, enough suitable work must be available. Discuss the social and support issues with current employees - to ensure that a positive atmosphere exists among employees and that all employees treat those with intellectual disabilities as equal members of the work team. Do not underestimate the work abilities of adults with Down syndrome.